I am apparently in a sappy romantic mood following that last one because this weeks DVD is Me Before You. Course, I picked a movie that needed even more kleenex than the last one. Good lord, if I keep this up, I should just buy stock in the company! Synopsis: An eccentric young woman takes a job working for semi-suicidal, grumpy, quadriplegic son of the wealthy family of the town. Can her magical energy change his life for the better? Why I chose this film: Not gonna lie- I saw the first previews and was teary eyed by the mush. But none of my friends wanted to go with me. Fail. I’ve not read the book, nor do I know much about the two leads, so it really was that preview that caught my attention. There was something about it that reminded me of Circle of Friends, which is one of my favorite films. Anyways, I’m glad it was on list because it was refreshing in the romance film department. They could have changed the ending to attract more of an audience. But I understand that it was not changed and thus a more realistic story (minus the billionaire aspect, obviously). I also want to mention that both the leads gave great performances. I loved the energy Emilia Clarke presented, from owning the characters eccentric costumes to bowling her eyes out when the outcome isn’t what she hopes. Sam Claflin did a great job presenting someone who has lost everything and given up, who can pretend in front of others but can’t lie to himself. And since I wanted to smack the lot of his family, include him, and shake them… I think that says a lot about the performances. 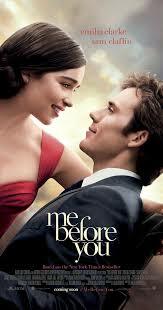 Also, I am now intrigued and will be looking for films starring Emilia Clarke and Sam Claflin. If anyone has a recommendation, drop me a line. Why you should watch it too (or run far away! ): It is sappy and silly and could possibly make you cry. If you don’t enjoy those things, this movie is not for you. But if you enjoy that sort of thing… grab the nearest box of kleenex, maybe some chocolates too, and have at it.